DALLAS — New research from Parks Associates finds smart speakers inspire strong brand loyalty among owners—97% of smart speaker households own only one brand in this device category. ‘360 Deep Dive: Consumer Demand for High-End Entertainment Devices’ reveals two-thirds of smart speaker households own an Echo device, while almost one-third own a Google Home. Low-end models such as the Echo Dot and Google Home Mini are the most common products owned, but the trend of brand loyalty in this early market creates opportunities for device makers to upsell premium products. 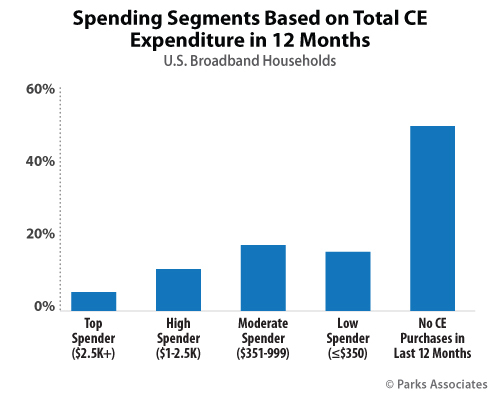 ‘360 Deep Dive: Consumer Demand for High-End Entertainment Devices’ measures the adoption and use of high-performance video, gaming, and audio devices among U.S. broadband households and the related content services used by owners of these platforms. It also presents an investigation of purchase motivations, buyer urgency (current vs. future purchasing), and options for device makers to drive greater adoption.